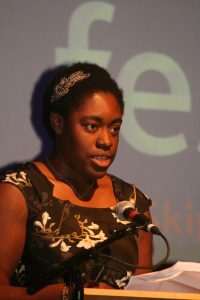 One of the judges on this year’s panel, Karen Onojaife won the SI Leeds Prize ‘Readers Choice’ in 2012 for her first novel, Borrowed Light. In this post, she shares her experiences and offers tips for anyone writing their first novel. It took me around five years to write my first novel, ‘Borrowed Light’. There were countless false starts and periods where I neglected it for months at a time. It was the subject of so many failed New Year resolutions, December rolling around again, with my uncompleted manuscript abandoned under a scatter of mince pie crumbs and left over wrapping paper. If this feels all too familiar, don’t despair: there’s every chance that one day you’ll say to yourself that you’re going to finish a first draft of your book and you’ll be right. Unfortunately, I can’t say how and when you’ll get there exactly, because not everyone’s writing journey will be the same. All I can offer is that if I had the chance to re-do my first time writing my novel, I would tell myself two things: be nice to yourself and have fun. If you’re talking about the nuts and bolts of actually sitting down to write, then there’s lots of helpful advice to be found. Just as vital is how one feels about the act of writing, and this guidance from the author Daniel José Older, really resonates for me. In it, he advocates the importance of being kind to yourself as an artist, by figuring out what kind of writer you are, and then adjusting your creative practice accordingly. If you have the inclination, means and capacity to write a thousand words every day then that’s fine. Older stresses that if your process doesn’t look like that, this is fine too, especially when the heart of a book is so often gleaned in the moments away from your desk. It all counts; the time you spend day dreaming, the time you spend researching, the time you spend reading the works of authors you admire, the time you spend doing all the things that make up your life. It makes sense that these myriad experiences – if you allow time to fully live them, will also serve you when you sit down to write, especially if your work is trying to capture life’s many complexities and contradictions. Nothing is going to make you feel less like committing to your novel if the very sight of your laptop makes you think of miserable chores, but there can actually be a lot of room for enjoyment when it comes to the first draft. At this stage of your writing, everything is pure possibility. If you’re a first-time novelist in particular, this period of getting to grips with the draft, while frustrating, can also be liberating. You can write what you want without anyone comparing it, favourably or otherwise, to your track record. Also, if you’re yet to acquire an agent and/or a book deal, or you’ve opted for self-publishing, then the only person you have to answer to, is yourself. I believe that whatever success writers achieve is often collaborative – be it input from trusted agents, editors and/or early readers. Nevertheless, I think it’s good for a writer at the start of a project, to have time to themselves where they can figure out what they want to write and why. Your blueprints will probably change a dozen times between planning and execution but if you’ve had the space to consider (without the sometimes very real constraints of contractual obligations or concerns about what is or isn’t fashionable in the mainstream market) what the essence of your work means for you, then the likelihood of you creating an authentic piece of work that makes you proud, increases. And if you believe in what you’re writing, chances are that this will come across to your readers too. When I submitted ‘Borrowed Light’, to the inaugural SI Leeds Literary Prize, it was on a whim. I’d had a few rejections already and was on the verge of just sticking the thing in a drawer, when I saw the competition details and decided that I might as well. It was in part, due to my experience with SI Leeds that I was encouraged to keep writing. Thanks to appearing on the Prize shortlist, I was approached by the person who would later become my agent – a few years and a few rewrites down the road. When you’re in the middle of that first draft though, you can’t always spend too much time thinking about agents, prizes, how you’re going to spend your record-breaking advance, or what amusing anecdotes you’ll share when you’re invited onto Desert Island Discs. Strive for discipline by all means, but also be gentle with yourself, enjoy what you’re doing, and put your words on the page as and when you can. It’ll take as long as it takes and no matter the length of your journey, you’ll have discovered things about yourself, about your work and you’ll have made a kind of magic – something new is in the world just because you willed it.